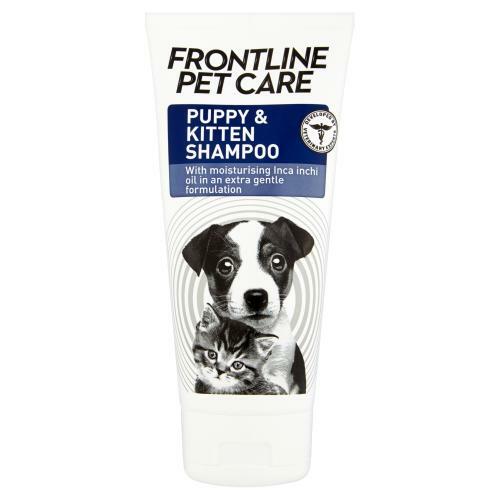 Frontline Pet Care Puppy & Kitten Shampoo is a kind and protective formula suitable for puppies and kittens over 8 weeks of age. This extra mild shampoo contains Inca inchi oil, rich in omega fatty acids, and is a soothing and a moisturising formula for a smooth, sleek and soft coat. Enriched with Rhamnose to cleanse, calm and protect from bacteria. 1) Put your pet at ease by calmly stroking them. Ensure the water temperature is comfortable. Apply shampoo on wet hair.Lather for 5–8 minutes. Rinse well.